As a young boy, I used to look at the stars and wonder about the adventures of people like Neil Armstrong. As a parent, I used to watch my children do the same and wonder about their future – would they be the ones to see the era of mass space travel? I think of the kids with lives so full of pollution that they can’t even see the stars or imagine a future or be healthy enough to care. I wonder if my grandson will travel because of his sense of adventure or because he is forced to find safe air and water for his family. Because, from 36,000 feet down in the Mariana Trench - the deepest part of the ocean - to 36,000 feet up in busy air traffic corridors and most places in between, humans are polluting everything we need to eat, drink or breathe. When did we slip from marveling at this amazing planet to casually destroying it? Become so numb to our surroundings that 13 deaths from a traffic accident can move us to tears, but up to 13 million deaths from pollution can’t even move us to action? Chemicals are a big part of that problem. We didn’t intend them to be. After all, they improve our lives in incredible ways. They provide clean water, medical care and hygiene. They support agriculture, clean energy and job creation. In fact, they contribute to almost everything that we use. But we are losing control of our own creations. We are introducing them across the planet much faster than we can assess their real impact on our lives and much faster than we can get any problems back under control. People talk about the risk of this with Artificial Intelligence in the future. Yet it’s already happening with chemicals. Everyday items like pizza boxes, microwave popcorn and baby nappies suddenly pose a threat to the hormone balance of humans, wildlife and our entire food chain. The difficulty is that once these substances are out there, getting the genie back into the bottle is not so easy and it’s not fast. Look at mercury. We are just a few months away from the first meeting of the Minamata Convention. Yet it will still be 60 years since the Minamata coast in Japan became synonymous with mercury poisoning. Even with agreement on what action to take, we still need to take it – fast! Because we are finding mercury in the once pristine waters of the Arctic. And we are letting it seep into our soil, water and air from millions of tonnes of electronic waste being dumped illegally each year. And that’s just one example. There is a huge variety of toxic chemicals in that growing pile of eWaste. And there are over 130,000 chemicals on the market, feeding 10 million tonnes of solid urban waste each year. Yet, incredibly, we only properly assess, control or label a fraction of them. We can’t keep dealing with them one at a time, once we have enough irrefutable scientific data to convince governments, producers, traders, doctors, lawmakers and the general public. Every stakeholder has a moral responsibility to act when there is a doubt, not when victims emerge, laws change and loopholes close. So yes, we need this conference to tackle the chemicals and waste on the agenda. But we also need it to trigger a rethink in our lifecycle approach to chemicals and the way we adapt to new findings. We need to work with governments and scientists to provide evidence and lead the assessment of all important chemicals and waste. We need to work with the private sector to develop better controls, quicker responses and innovative alternatives. We need to work with schools to look at how we educate young people who will develop the chemicals, pharmaceuticals and consumer products of the future. And we need to work with the general public to leverage their purchasing power and household decision making. In the 30th Anniversary year of the Montreal Protocol, sometimes it’s good to remember just how powerful concerted action by all the stakeholders can be. How important it can be to take precautionary action even before the hard, scientific evidence emerges. And this doesn’t need to come at a cost; it can come with a profit. Global chemical sales are already worth up to $5 trillion per year and will triple by 2050. So, what’s good for the planet can also be good for business. For example, 300 million tonnes of plastic are produced every year and up to 13 million tonnes of that end up on our oceans. The growing backlash from consumers creates a huge market for alternatives. Not the kind of things that only biodegrade in specific conditions, but a true lifecycle alternative that works everywhere. And we see the huge increase in demand for renewable energy, mobile technology and electric transport. They all need batteries that can efficiently store power and still be safely managed when they are no longer needed. Dear colleagues, holding this triple conference to agree a global response to the threat from chemical and hazardous waste reflects the scale of the task before us. And they do give us a chance to reset the way we work with all stakeholders to treat chemicals and waste from now on. and the Paris Agreement on Climate Change. The pollution on this planet has never been worse. The impact on our people has never been more deadly. But the time to fix it has never been better. While no single nation can control chemicals on their own. 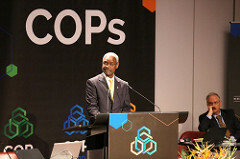 At last year’s UN Environment Assembly, nearly 200 nations asked us to explore the role of chemicals in the 2030 Agenda. This year, with the Assembly serving as a summit on pollution, the chemicals and waste sector will be an important voice for change. Just as pollution has no limits when it spreads, we can’t afford to have any limits when we seek solutions. We need policy and law makers, public and private sector, civil society and individual women, men and children. Ladies and gentlemen, if we have the power to block the stars from our children and to poison the most remote corners of the ocean, then surely we also have the power to reverse it? So, let me leave you with a personal request. Sit your own kids or grandkids or friend’s kids on your knee. Look up at the stars together. And ask yourself: during these two weeks, did we really do everything we could? Or did we miss an incredible opportunity? To achieve the sound management of chemicals by 2020. To add important new chemicals to the three conventions. And to use the power of global agreements to achieve global progress. Please, let’s not have any regrets.